Soviet women did more than keep the homefires burning during World War II. On the first page of Lyuba Vinogradova’s fine book about Soviet women pilots, she compares Hitler’s attempted invasion of Moscow in 1941 to Napoleon’s in 1812. Vinogradova centers her comparison on the neo-gothic Petrovsky Palace, built on the road to St. Petersburg in the late 18th-century as a rest house for traveling royalty. Napoleon sheltered here as Moscow burned and the palace later became an aeronautical academy, whose alumni included cosmonaut Yuri Gagarin. By World War II, when Vinogradova takes up the tale, the palace’s rooms are noisy with “a more motley assembly than they had ever witnessed,” directed by women in uniform. Born in Moscow, Vinogradova describes herself as “not an historian,” but she has worked in many Russian archives. She helped research Antony Beevor’s skillful patchwork of human stories in Stalingrad and many other books. She collaborated with Beevor again on the translation and editing of Vasily Grossman’s diaries in A Writer at War. Arch Tait, who translated Vinogradova’s book from Russian, has captured her slightly breathless style as she details the lives of these diverse and courageous women, from penniless poultry farmers to budding astronomers. But Vinogranova’s book is not a simple tale of idealism, heroism and survival. Marina Raskova, whose record-breaking adventures as an aviatrix inspired “millions of Soviet women,” is soon revealed as a secret officer of the NKVD, the KGB’s murderous precursor. 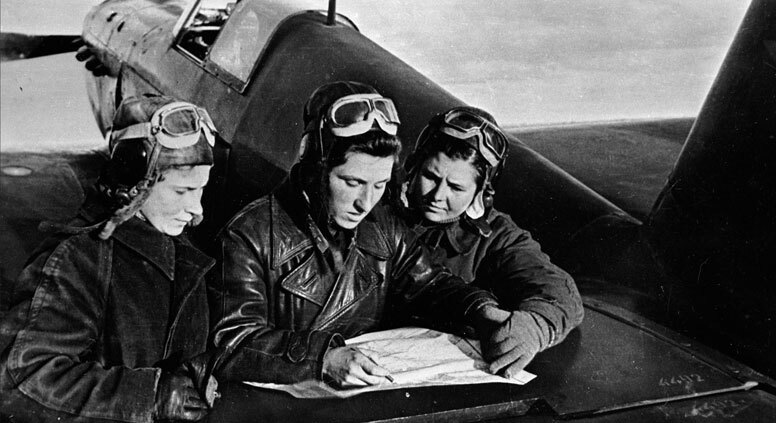 Legendary pilot Valentina Grizodubova later said bitterly of Raskova: “I have no doubt that people suffered because of her.” Vinogradova’s awareness of context and complexity show how one generation’s idols can become uneasy ghosts. In the cold, retrospective light of history the image of young Raskova, dressed in military white, skywriting “Glory to Stalin!” at the annual Soviet air show Tushino Aviation Day, is more chilling than heart-warming. During World War II, nearly a million women served in the Soviet forces and Vinogradova, whose next book will cover female Red Army snipers, has unearthed a rich seam of historical detail in charting their relatively unknown stories.